Day 8…. Barley Max Arrived! In the middle of my brisk walk this morning… I got hit with some rain. So I picked up the pace and ran home the rest of the way. I made my Mid Morning 8oz Juice of Carrot, Celery, Cucumbers and then headed off to the shower. Again this morning I had some appointments in Daytona to attend to in the morning. Then my afternoon was open to work from home. 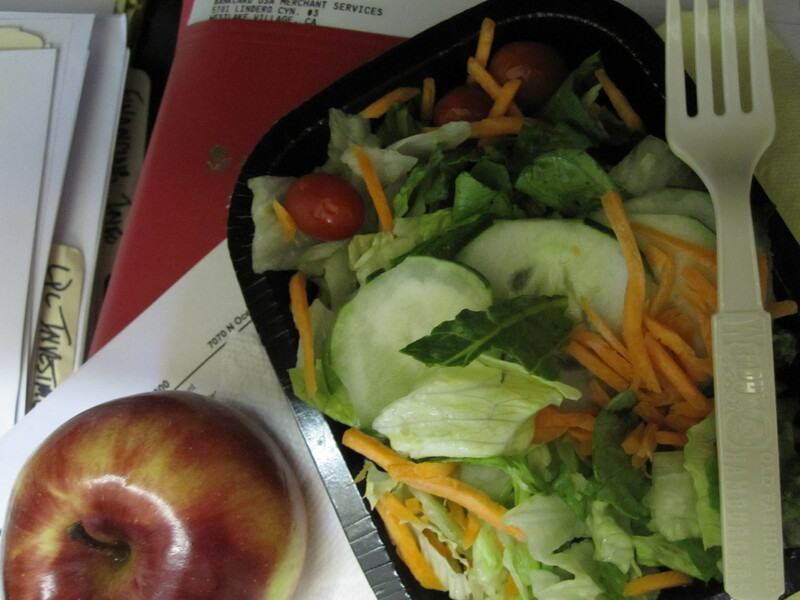 For Lunch I remembered that Wendy’s had a nice Garden Salad, so on my way home, I stopped in and got at Garden Salad. I took it home and proceeded to eat the salad on a pile of papers in my office and grabbed an Apple to enjoy as well. Then I hit the Walmart, to do a more extensive shopping adventure. 30 Minutes before Dinner 1Tsp Barley Max Powder mixed with 4-8oz Distilled Water. Directions: Wash spinach leaves, slice raddish, and green onions and mix into bowl with cranberries and sunflower seeds. Add dressing of your choice. I picked something out of the refrigerator.. a Wish Bone Italian Dressing. Directions: Sliced Whole Wheat Bread, apply Hummus to the bread and layer with sliced vegetables. And it was time to watch the season finale of Dancing With The Stars… Nicole’s sure to win it!!! I woke up happy to be in Florida and decided, since I won’t have time for a Pilates Class this morning, I will take a quick walk around the neighborhood. I went for a quick 45 minute walk and jumped in the shower. Breakfast… was just some water and vitamin supplements, because I was still waiting on my Barley Max order. I didn’t make a Mid Morning 8oz Juice because we were out of all the ingredients. So I made a mental note to stop off at the grocery store for a quick run in to get some Carrots and Celery. I drove down to Daytona for some appointments and then headed over to meet a friend of mine at her office. 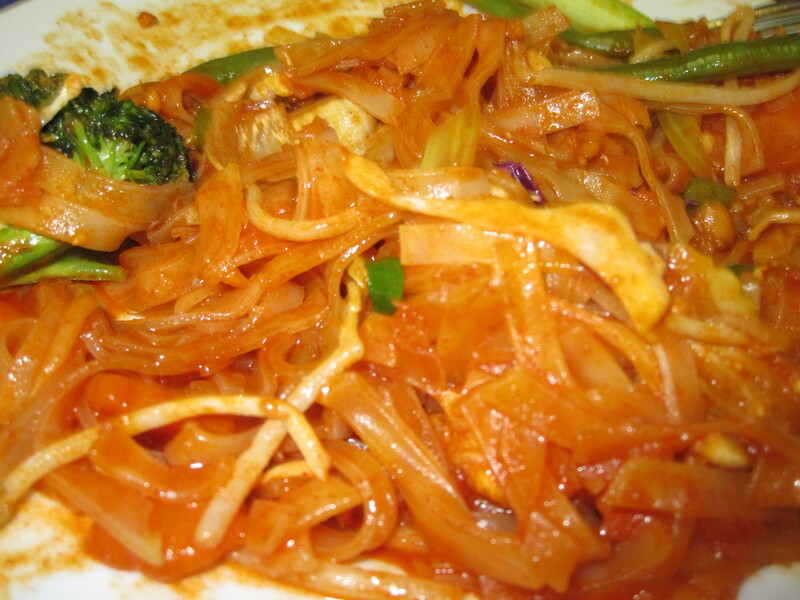 We decided to hit our local lunch spot, Zen Bistro for my usual Veggie Phad Thai Dish. I get the noodles with no eggs and the peanuts on the side and enjoy. I headed back up to Palm Coast, stopped off at the grocery store and headed back to the house to make my Mid Afternoon 8oz Juice of Carrot, Celery, Cucumbers. Then I went back out to get my hair done…. it was a long time coming for this haircut.! I got home and tried to feel out the situation for dinner. 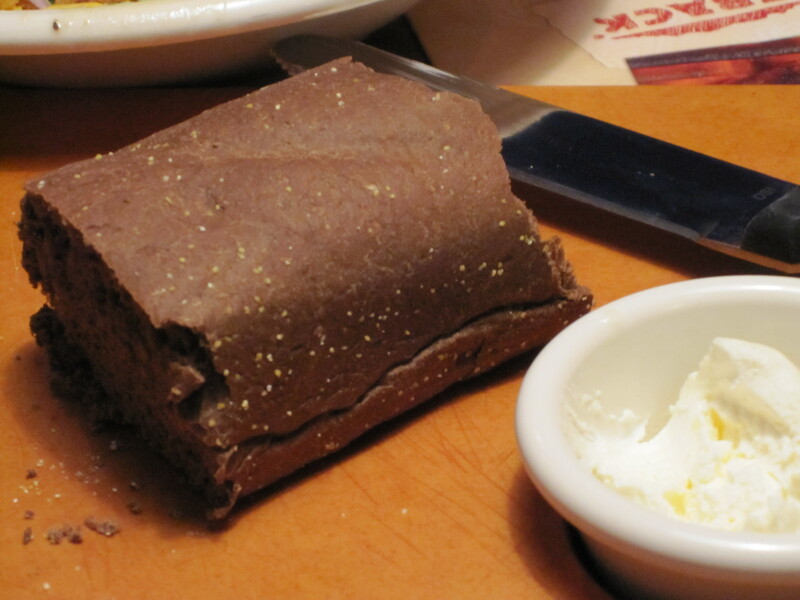 Mike decided on dinner at the Outback Restaurant, which was fine with me, because I didn’t have to make anything. We got there after picking up one of Mike’s other sons… and I had a Glass of White Wine and had some bread and butter while we waited for our meals to come out. 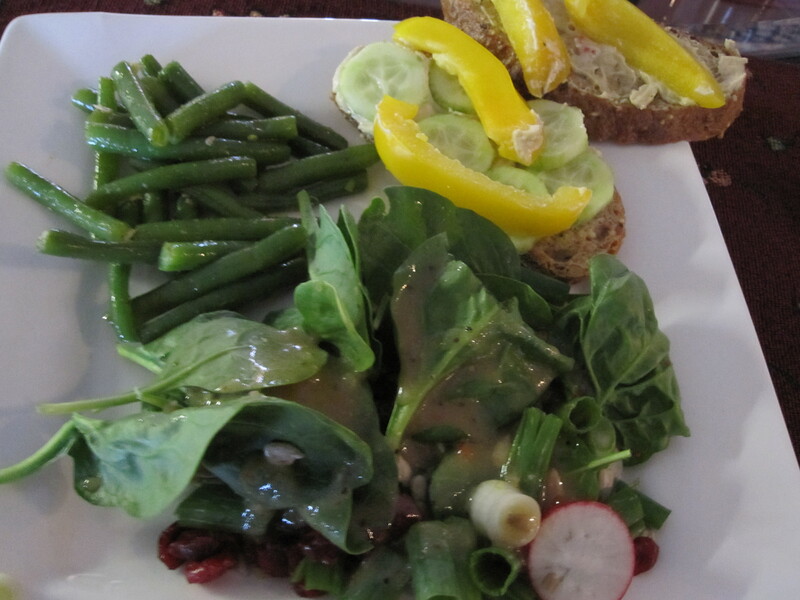 I had some of Mike’s Garden Salad before my Norwegian Salmon with Steamed Veggies came to the table. It was a really great meal, however, I could really taste the butter in the veggies and in the salmon. It was a bitt of a system shocker.! We got up early… Monday morning and started getting ready for our journey back down to Florida. I showered and packed up the rest of my bathroom supplies and headed downstairs to make my juice for my Mid Morning and Mid Afternoon drinks. 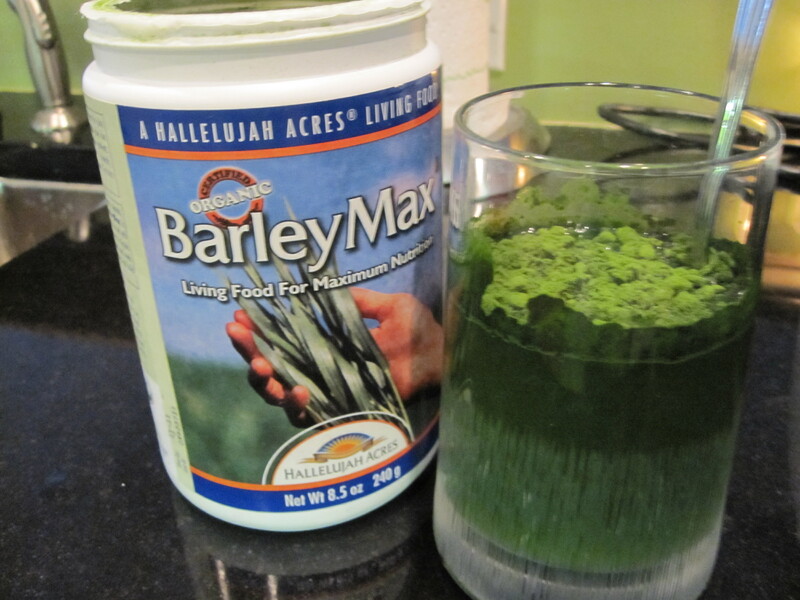 Breakfast was a 1tsp of Barley Max Powder mixed with 4-8oz of Distilled Water. And that was it for the Barley Max.!!! And we hit the road at 7:30am… it was much later than we wanted to be leave, but Mike didn’t get up any earlier so that’s when we left. Lunch was Apples until I was satisfied. Here’s where it all went to pot… at dinner. We just pulled off the interstate at our exit in Palm Coast and we decided to go to Wendy’s. I didn’t want to cook anything and they have a really great $1 menu. I ordered a Garden Salad, Baked Potato and a Fish Filet Sandwich.!!! I know, but I had this really strong craving for the sandwich. It seems these days, I get really strong cravings for food and I can’t say no. It’s like I haven’t eaten in so long, it feels like my stomach is going to come out of my body and take over. I feel so ravaged by hunger, I eat anything and everything that’s not good for me.!! I don’t know how to cure this, but with little healthy snacks throughout the day?!?! No Pilates Class this morning… instead,after my 1tsp of Barley Max Powder mixed with 4-8oz of Distilled Water, I headed off to Church at the National Cathedral in Washington D.C.. Afterwards, I met up with a girlfriend of mine from Daytona Beach, Florida for coffee. We met a the Dean and Doluca Shop in Georgetown off M Street. It was only a mile or 2 from the Cathedral, but it took me forever to get there. I ended up parking at Q Street because I wasn’t sure I’d get a good parking spot on M Street. Then I had to walk the 5 or so blocks in heals on cobble stone sidewalks. Best of all thought, I didn’t have a coffee or even a tea. Instead, I had my Mid Afternoon 8oz Juice At Robeks Fruit Smoothie place, where they also juice vegetables like Carrots, Celery, Spinach and Apple. 30 Minutes before Lunch 1tsp of Barley Max Powder mixed with 4-8oz of Distilled Water. I noticed I was getting lower and lower on my Barley Max Supply, and was thinking I will never make it until my new shipment comes Tuesday. We started packing for our journey back down to Florida, and I ate another Veggie Sandwich and some Hummus and Pita Chips. Directions: Slice Bread, Wash and Slice Vegetables and layer on bread with Hummus spread. Mid Afternoon 8oz Juice of Carrots, Celery, Spinach, Apples left over from my Robecks stop earlier in the day. 30 Minutes before Dinner 1tsp of Barley Max Powder mixed with 4-8oz of Distilled Water. Dinner was a hodge podge of leftovers, Pita Chips and Hummus. Afterwards, we felt a little adventurous, so we piled in the car and walked along the Potomac River for some exercise. It was a great day for it too. The sun was out and everyone was enjoying the day as well. After my pilates class Saturday morning… we decided to go on a road trip to Northern Maryland and the West Virginia boarder to The Bovarian Inn. I made an 8oz Juice of Carrot, Spinach, Celery for my Mid Morning Juice that I’d be drinking on the road. 30 Minutes Before Lunch 1tsp of Barley Max Powder mixed with 4-8oz Distilled Water. Lunch was Apples until I was Satisfied… Lunch took place on the road while we were driving to West Virginia. We finally got to the Bovarian Inn along the Potomac River boarder of West Virginia and Maryland. It’s a beautiful place to go just for the scenery alone and then the food, well it’s a Bovarian Eastern European Fare. The dining room had an old-dated european influence, but the view out of their big picture windows make up for the decor inside. I wanted to obstain from eating another lunch, but I had a hard time. Afterall, I was still a little hungry and my stomach was feeling empty. So I ordered a Vegetable Sandwich with Fried, Zucchini and Carrots. It was a nice lite addition to my earlier lunch in the car. Then we walked around and enjoyed the scenery of the mountains, the river below and each other. We took out sight seeing down into the middle of town where all the shops and people were bustling, but then it started to rain. We made it into the car before it started pouring down hard… and continued on back home. 30 Minutes Before Dinner 1tsp of Barley Max Powder mixed with 4-8oz Distilled Water. I made my own Vegetable Sandwich with Whole Wheat Bread and Hummus and snacked on some Pita Chips with Hummus too. If you haven’t noticed already, I’m taking a break from the book on this Hallelujah Acres 14 Day Eating Plan and incorporating my own stuff into it.. and maybe this will make a difference as well. So I took my 1tsp of Barley Max Powder mixed with 4-8oz of Distilled Water for Breakfast. 30 minutes before lunch, 1tsp Barley Max Powder mixed with 4-8oz of Distilled Water. Lunch will be Apples until I’m satisfied!!! Plus I did some snacking on Stacy’s Pita Chips with Hummus. 30 Minutes before Dinner, 1tsp Barley Max Powder mixed with 4-8oz of Distilled Water. We drove to Alexandria for a farewell meal at Mike’s favorite restaurant, the Chart House. It was a lovely evening, cooling down from the 80 degree temps from the day. Everyone was out with their kids in the park, people were walking dogs, it was just a great night for a slow strole and a nice dinner by the water. When we got into the restaurant, we had to wait 30 minutes for a table so I indulged in a Bombay Sapphire and Tonic and we ordered an appetizer of Shrimp Cocktail. For the main meal, we were seated outside on the patio while the sun was still up, and by the time I ate my Chopped Salad, it was dark. We got up at 5am to get ready and out the door by 7:15am this morning, because I was going on the school field trip to Gettysburg Pennsylvania with 450 middle school kids from Potomac, Maryland. This was a class field trip for Mikes son, so needless to say, I missed my pilates. But not to worry, I was going to be walking and hiking parts of the battle field, so I wasn’t worried. So I packed a bag of my Fresh 8oz Juice of Carrot, Spinach, Celery for my Mid Morning Juice. Which I got to during a trip through the museum, where the kids had to fill out there packet of questions for a grade. FUN!!!! Lunch was a couple of apples and some trail mix I mixed together with a hand full of Organic Cranberries, Organic Raisins and a Flaxseed Mix. Then we stayed on the bus and went for our actual battlefield tour of Gettysburg. That’s were we drove into the town of Gettysburg and into the many battlefield grounds. This was exciting, because we got out and toured some of the grounds and got the 411 on how these 3 days in July played out! At 3pm, I was ready to go home and luckily that’s when our field trip ended and we started our 11/2 hour bus ride back home. When we got to the school, we had to wait for Mike to pick us up and he ended up getting lost, because it was the high school down the street from our morning drop off at the middle school. So we started walking to the middle school when we saw Mike coming to pick us up. When we got home, I made my Mid Afternoon 8oz Juice of Carrot, Celery, Spinach. 30minutes before we went to dinner 1tsp of Barley Max Powder with 4-8oz of Distilled Water. Dinner was at Wildfire Restaurant where I had the Greek Salad with a Vinaigrette Dressing and some Roasted Vegetables. 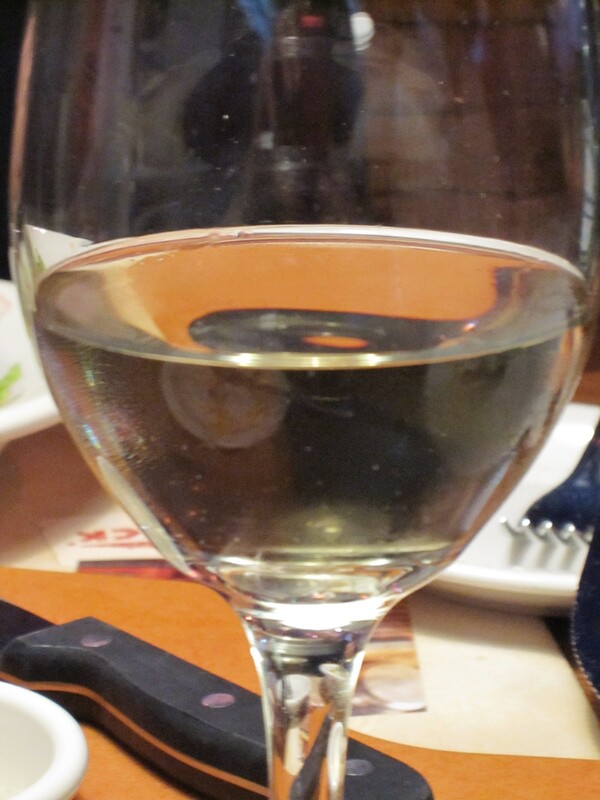 I did also manage to stay away from the White Wine with dinner!! !